5) Attending the red carpet premiere of American Hustle & meeting Jeremy Renner at the afterparty – Last winter, my friend Leonard and I were lucky enough to attend the NYC premiere of American Hustle. Before the film, the director, David O. Russell gave a speech and we saw Christian Bale while he answered questions on the red carpet. After the movie we got to attend the afterparty along with all the stars in the film (sans Jennifer Lawrence because she’s doing press for The Hunger Games). Jeremy Renner aka Hawkeye put his arm around my waist while we were talking and it was SO hard to act normal! We also saw Amy Adams, Bradley Cooper, and Louis C.K. 4) Dan Slott inviting me to see The Avengers a week early for the Marvel screening – Most people are aware that my favorite superhero is Spider-Man. A few years ago when I was just starting to use Twitter I became friendly with Dan Slott, the writer of Spider-Man and I almost fainted when he invited me to see The Avengers an entire week early with him at the Marvel screening. I wrote a blog post about why Dan’s invitation and The Avengers means so much to me<3 Dan also took me to see Spider-Man: Turn Off the Dark, which is the silliest musical adaptation. Luckily, no one was hurt during the performance we attended! 3) Every single time I’ve come in contact with Neil Gaiman – The first story is the best which is when Neil Gaiman literally interrupted me to ask if I needed a hug because I could not stop talking. I told Neil Gaiman that I want his brain but not in the way that zombies want brains. That’s an actual thing I’ve said to my literary idol. The time I am speaking of occurred at Barnes and Noble for the Best American Comics signing (in retrospect, I’m sad that I couldn’t pay more attention to my interaction with Bryan Lee O’Malley but I was just so over-excited about seeing Neil). Since then I’ve also seen Neil in conversation with Lev Grossman at the 92Y, dressed as Charles Dickens and reading A Christmas Carol at the NYPL, and most recently, in Washington Square Park handing out free books in the freezing cold with Lemony Snicket. 1) Interning for Stan Lee / Being cast on a TV show on the Syfy channel – I’ve always wanted to visit LA and after a grueling three year process, I was chosen to be a cast member on a TV show called Fangasm which gave me the opportunity to LIVE in LA. The show was produced by the same company who created Jersey Shore, only it sounded wildly more interesting to me because we were able to intern for the living comic legend, Stan Lee! While on the show there were a number of wonderful things that happened to me. I can now say that George Takaei was in my living room, I pitched an original comic idea to Stan Lee, had Adrianne Curry (the first winner of America’s Next Top Model) in my living room so I could interview her for a podcast, hosted a party in the Great Hall at Whimsic Alley, attended the Syfy party at SDCC and hung out with cast members from Being Human and Warehouse 13, went to E3 and stayed at fancy hotels, filmed promos and been part of professional photoshoots, all the while being followed by cameras and having a bruised back from my ever present microphone. Midtown Comics also hosted a premiere party for me and it was so much fun! It’s still so weird to me to think about have worked on the set of a television show. Wow!! So many amazing things! I’m so jealous over Renner. SO JEALOUS! 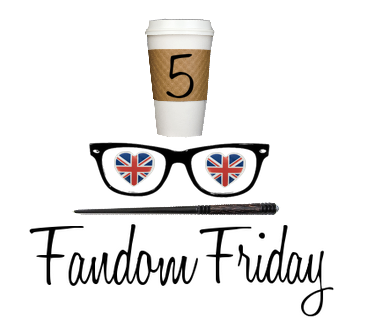 B recently posted…5 Fandom Friday: Five Times I Totally Fangirled! I LOVE the dress you wore to American Hustle!! So pretty!! I hate when I get too excited bc I usually embarrass myself…. like when I told Sarah Mlynowski that I loved her book 10 Things I Hate About You (I meant to say 10 Things We Did and Probably Shouldn’t Have). MORTIFIED. You’ve hung out with Stan Lee, George lucas and George Takaei Oh. My. God!!! I’m soooooooo jealous! I want your brain…but not in the way a zombie wants brains is exactly the type o thing my no filter brain would come out with haha! I am so jealous! You met Jeremy Renner! So coool! Gladys recently posted…One Fandom Item Styled Five Different Ways! Gaby recently posted…Fandom Friday: Five Times I Shamelessly Fangirled! Wow, you’ve had some amazing opportunities! And met so many cool people! Holy amazing-ness batman! I’m so jealous of your meeting Neil Gaiman and Stan Lee! That’s so awesome! I remember seeing commercials for Fangasm! How cool! You are officially the coolest person I know! I’m pretty sure my husband is going to DIE when he learns you interned for Stan Lee! OMG! So, I read “Interned for Stan Lee”…and I legit squealed with glee! That’s so cool! So lucky! These are AWESOME fangirl moments!